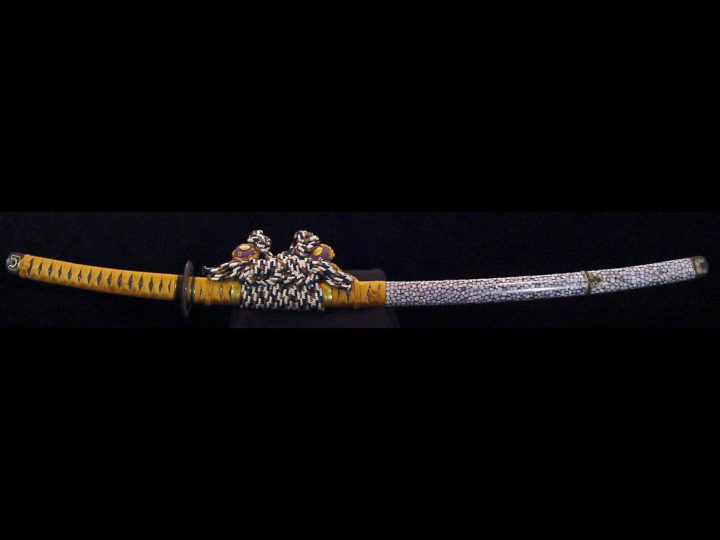 I am very pleased to offer for sale this outstanding Itomaki no Tachi Koshirae. It was awarded Jûyô Kodogu status in 1974. 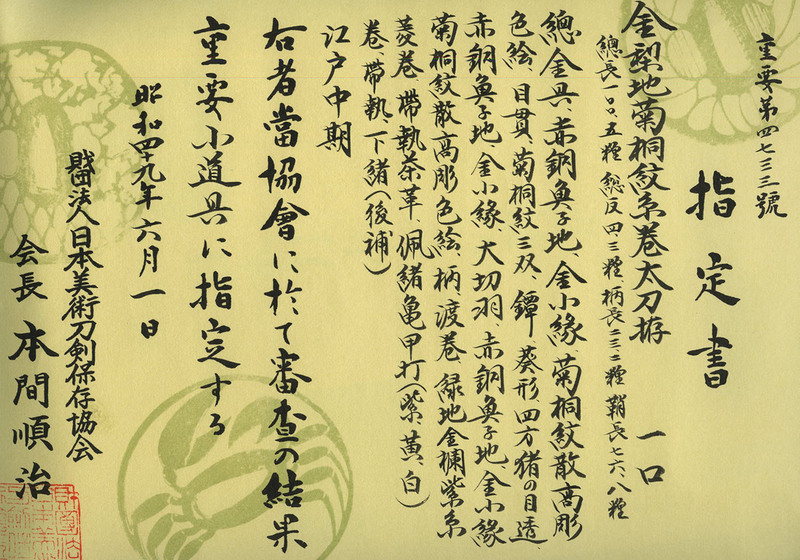 It is also purportedly to have been handed down in the Uesugi Daimyo family. 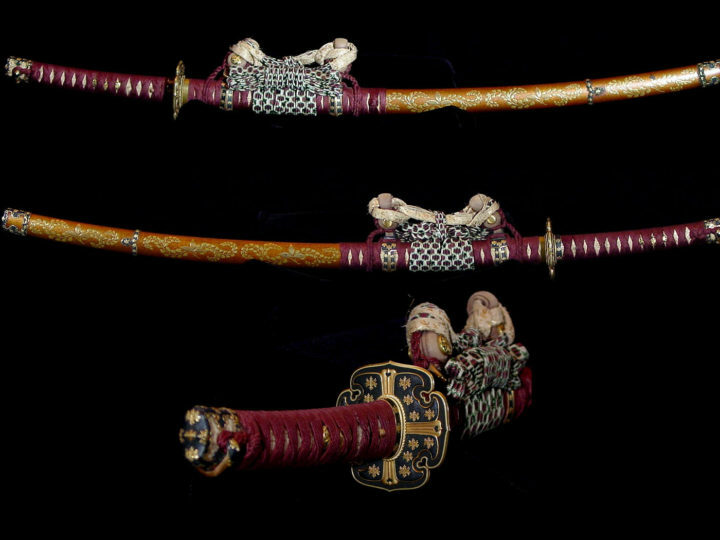 One of the first things one notices about this fine koshirae is that the gold has attained a beautiful reddish hue. 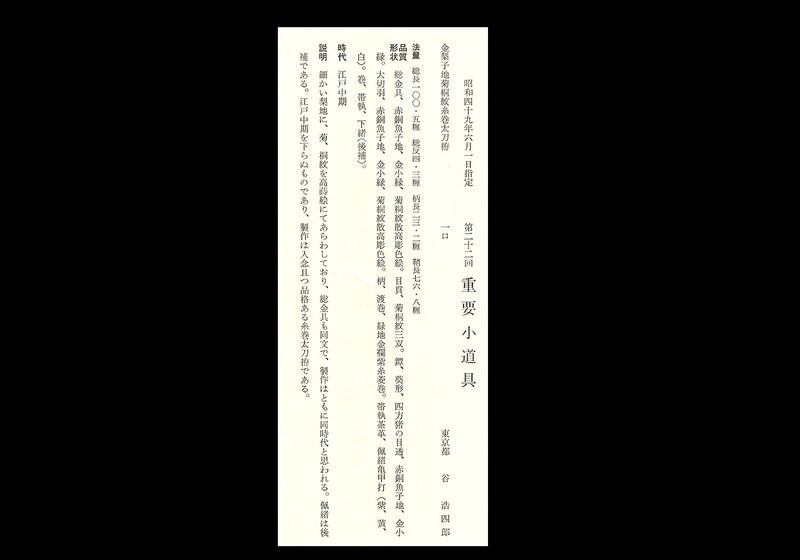 This indicates that it is of a substantial age and further verifies the opinion of the NBTHK that this koshirae is several hundred years old. This reddish hue cannot be faked or duplicated and only occurs on gold that has been carefully cared for for many many years. 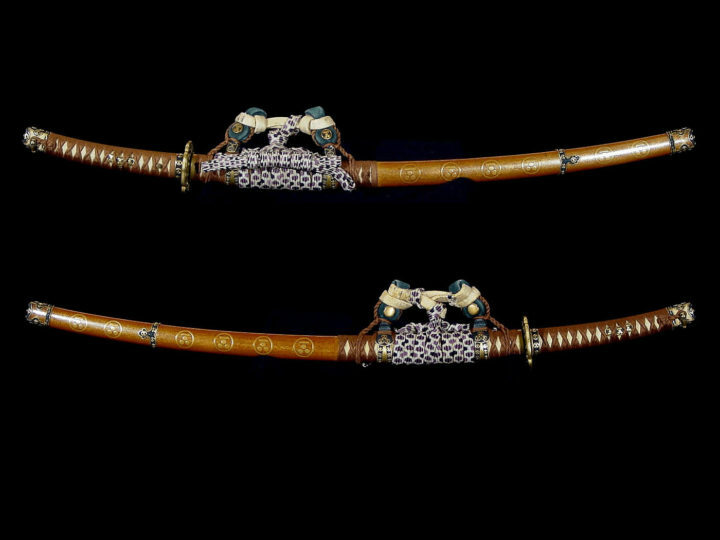 This koshirae has been treasured by its many owners and preserved in superb condition with no damage or problems what-so-ever. Gold nashiji ground chrysanthemum and paulownia crested itomaki-tachi koshirae. 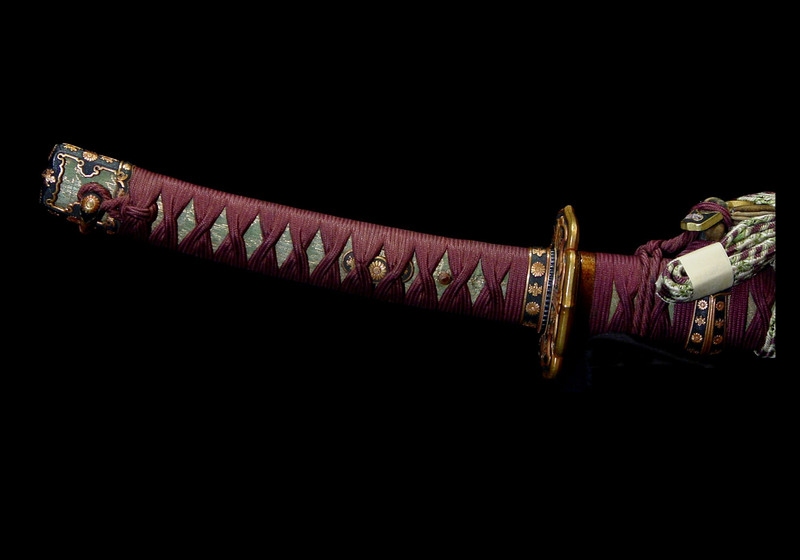 Dimensions: Overall length: 100.5 cm; overall curvature: 4.3 cm; tsuka length: 23.2 cm; saya length: 76.8 cm. Fittings: Entire metal mounts, shakudô nanako ground, gold rims, scattered chrysanthemum and paulownia crests in high relief carving and gold iroe. The menuki are three chrysanthemum and paulownia crests. The tsuba is aoi-gata with four boar’s eye openings, shakudô with a nanako ground and a gold rim. The ô-seppa are shakudô with a nanako ground, gold rim and scattered chrysanthemum and paulownia crests in high relief carving and gold iroe. The tsuka is watari-maki (cloth covered), and the cloth has a green ground with gold threads and is wrapped in purple itobishi-maki (cord wrapped with triangle openings). 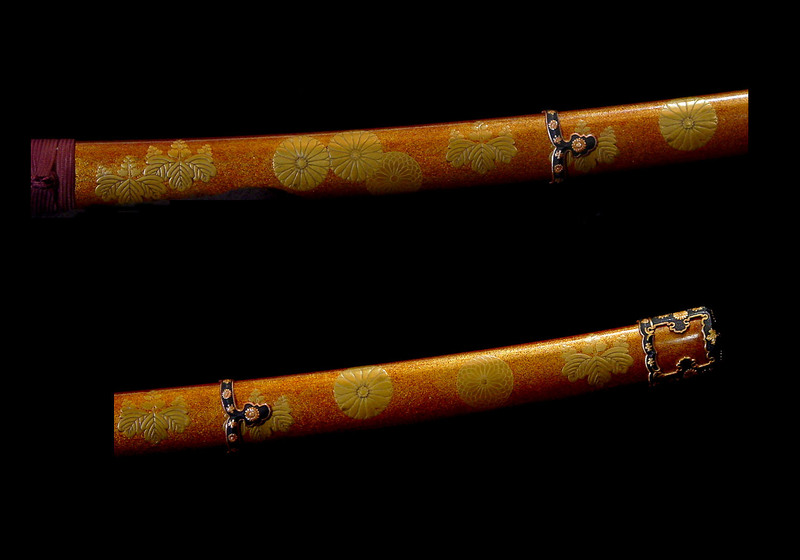 The leather hangers are tan colored, and the wrap on the saya is in a kinkô (hexagonal) pattern. 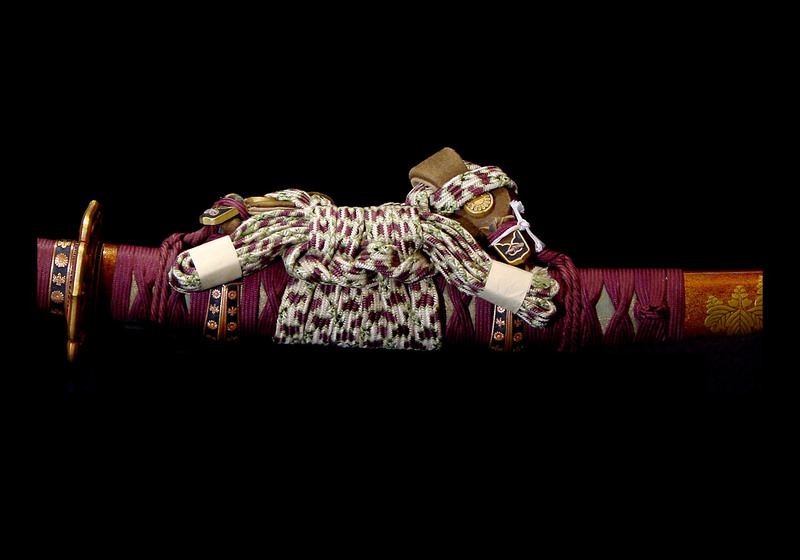 There is a sageô (in purple, yellow and white) wrapped around the saya (added later). 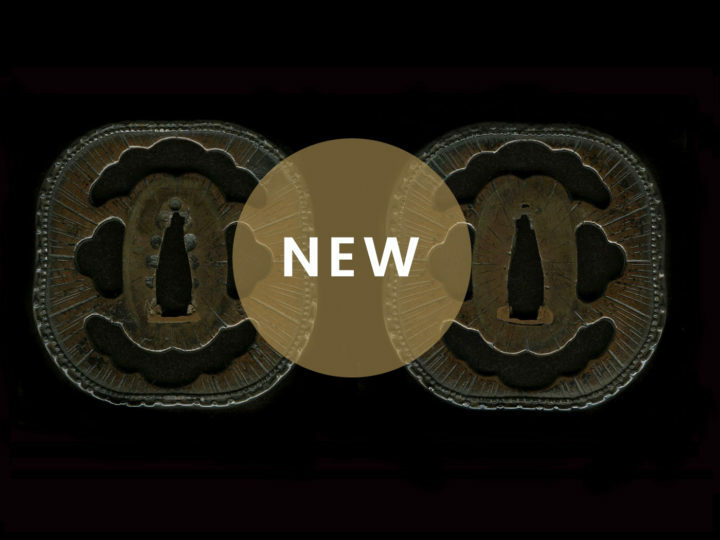 Description: The nashiji ground is very fine, there are high relief maki-e chrysanthemum and paulownia crests, and the fittings have the same pattern, all of which are believed to be contemporary. The waist cord (sageô) was added later. 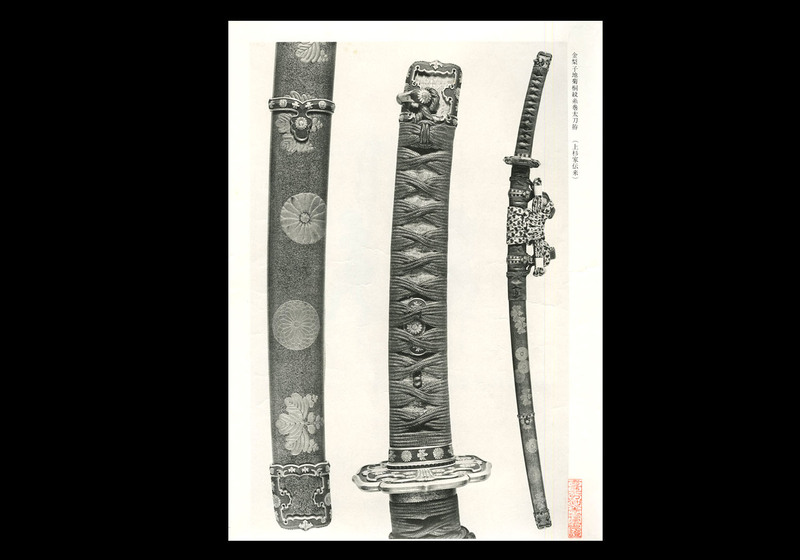 This koshirae does not date to later than the middle of the Edo period. 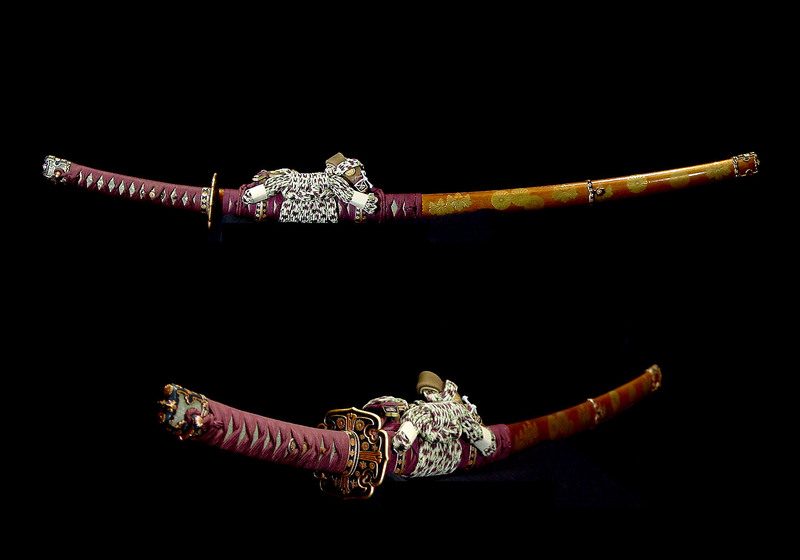 This is a scrupulously made piece that is also a very elegant itomaki-tachi koshirae.